Thank-you to George Geder for letting me know about the United Nation's International Decade for People of African Descent 2015-2024 in his post The Invisible Man, Yet Again. 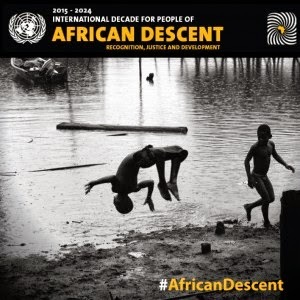 The General Assembly, by its resolution 68/237 of 23 December 2013, proclaimed the International Decade for People of African Descent commencing 1 January 2015 and ending on 31 December 2024, with the theme “People of African descent: recognition, justice and development”. The main objective of the International Decade is to promote respect, protection and fulfillment of all human rights and fundamental freedoms for people of African descent, as recognized in the Universal Declaration of Human Rights. The decade will provide an opportunity to recognize the significant contribution made by people of African descent to our societies and to propose concrete measures to promote their full inclusion and to combat all forms of racism, racial discrimination, xenophobia and related intolerance. To adopt and strengthen national, regional and international legal frameworks in accordance with the Durban Declaration and Programme of Action and the International Convention on the Elimination of All forms of Racial Discrimination, and to ensure their full and effective implementation. The International Decade will enable the United Nations, Member States, civil society and all other relevant actors to join with people of African descent and take effective measures for the implementation of the programme of activities in the spirit of recognition, justice and development. The General Assembly, in its resolution 62/122 of 17 December 2007, declared 25 March the International Day of Remembrance of the Victims of Slavery and the Transatlantic Slave Trade, to be observed annually.